That issue was a full redesign - our stories broken into five chapters each representing a different dimension. Encompassing that into a singular image or statement was really tough. 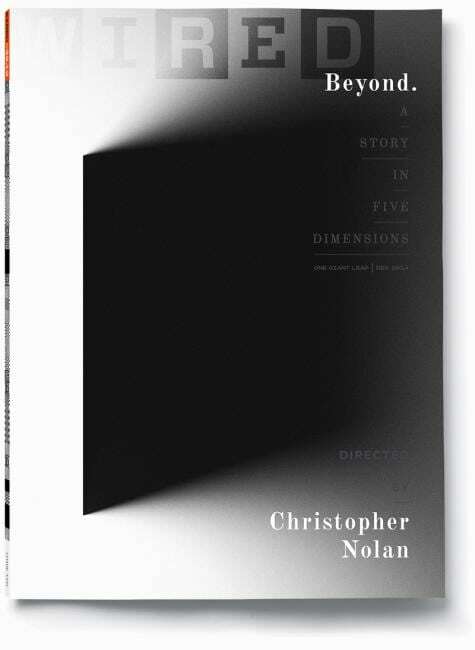 I designed multiple covers, but ultimately Chris Nolan, Scott Dadich and myself all resonated with the simplicity and mystery of the cover that went to print. I worked with Mario Hugo to illustrate each of the five dimensions represented in the issue (Line, Plane, Space, Time, Multiverse) as well as the cover image. The image represents the reader entering into the first dimension, thus beginning the journey throughout the issue. The last page of the magazine has the cover image inverted, representing the reader’s exit. The animated version of the cover is my favorite. I worked with animator Anthony Zazzi to bring the sentiment of the cover to life, while keeping the content within the magazine a mystery – inviting the reader to explore themselves, rather than be sold on it via coverlines or content hooks. I feel incredibly lucky to have had the experience of making this issue with my WIRED family and the brilliant creative duo of Chris Nolan and Emma Thomas."